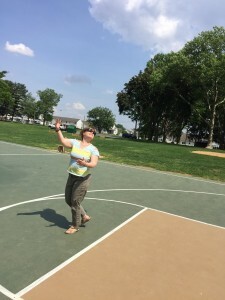 Estate paralegal Jennifer Marcus takes a behind-the-back foul shot. Understanding the value of a dedicated and competent support staff, the GKH partners have always made recognition and appreciation of their employees a top priority. “Without the efforts of our legal and administrative support staff, Gibbel Kraybill & Hess would not be the firm it is today. While the attorneys operate in the public eye and receive most of the recognition, we couldn’t do it without these folks diligently serving in the back offices,” says founding partner John Gibbel. Every year, the GKH partners host an event to honor the firm’s support staff. On Friday, May 19, the office closed at 1 p.m. so attorneys and staff could gather at the Manheim Township Park for the 2017 Staff Appreciation picnic. Lunch was catered by Our House Café. After lunch, attorneys and staff participated in a series of team games planned by John Gibbel and legal administrator Sue Groff. Teams earned points tossing beanbags, rolling croquet balls through wickets, shooting baskets backwards from the foul line, throwing water balloons, and creating the longest word possible from the letters in “Gibbel Kraybill and Hess Attorneys at Law.” The good humor with which everyone participated in the silliness was a tribute to the sense of community and goodwill that exists at GKH. All employees received a beautiful planter of flowers, herbs, or both, created by Ken’s Gardens of Smoketown.